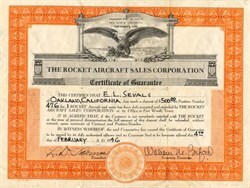 Beautifully engraved RARE certificate from the Rocket Aircraft Sales Corporation issued in 1946. This historic document has an ornate border around it with a vignette of an eagle. This item is hand signed by the Company's President, L. D. Thomas and Secretary, William M. Barford and is over 59 years old. The certificate was for position number 476 for one Rocket Aircraft. It was issued to E. L. Sevals. Rufus Summerfield "Pop" Johnson was a machinist who had worked as an Army aircraft mechanic. In 1923, Johnson, like many others in that era, built what he felt was an improvement over the Curtiss Jenny. He was later associated with Alexander Aircraft and Culver, possibly as a dealer or distributor. His associations with the Swift and the Johnson Rocket are the best documented periods of his life. "Pop" Johnson built a prototype Rocket "125" during 1942. The airplane has a tail wheel layout, low wing and a Lycoming O-290 engine. It was never awarded an Approved Type Certificate but has always been an amateur built airplane. Some sources indicate that Johnson also helped design both the Culver Cadet and the Globe Swift, both of which have similar configurations. Johnson announced the Rocket 185 in Aug 1945. 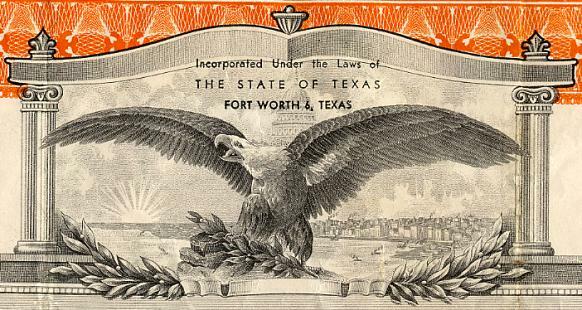 Design and manufacture of the Rocket took place at Fort Worth, Texas. A two place, low wing monoplane, it is equipped with a retractable tri-cycle landing gear. Designed and built by Johnson Aircraft, Fort Worth, Texas. The wing is of primarily wood construction, the fuselage being built with 4130 steel tubing covered with plywood. The airplane is stressed for 9G loads, aerobatic strength. Appearing just after World War II, the airplane provided excellent performance with a top speed of almost 200 m.p.h. using a 6 cylinder Lycoming O-435A engine of 190 HP. Price - $5,000 dollars in 1946, much higher today! Statistics - length 21 feet 10 inches, wing span 30 feet 10 inches, height to top of the rudder 8 feet 5 inches, wing area 141 square feet. Empty weight from the factory 1650 pounds, gross weight 2400 pounds. Believe these were later increased to 1775 and 2550 pounds respectively. Performance - Top Speed 180 m.p.h. at sea level. Stall speed about 68 m.p.h. Cruise speed 160 m.p.h. at 8,000 feet. Climb 950 feet first minute. Range about 650 miles. Red line speed 230 m.p.h. Only 18 or 19 Johnson Rockets were built at Fort Worth, Texas. They are licensed with full approved type certificate, number 776 issued September 10, 1946. About the time of certification, the national distributor, Rocket Aircraft Sales Corp., purchased controlling interest and changed the name to Rocket Aircraft, Inc. One problem with sales was the Rocket was a two place airplane and was competing against the 4 place Beech Bonanza and Ryan Navion, both of which have similar performance, and both were of all metal construction.